Learning how to wax your own skis can save you money and enhance your overall performance. Once you master the following basics of ski waxing, you will be surprised at how simple the process truly is to do at home. 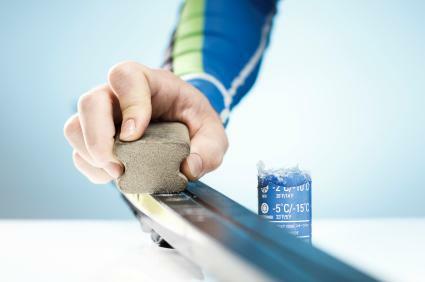 Ski wax: Choose a wax that is appropriate for the current temperature and your specific skis. Ski vise: You need this to hold your skis in place. Waxing iron: Use an iron without steam. 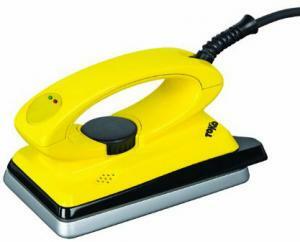 A travel iron or an iron designed for ski waxing are both ideal. Nylon brush: Get a brush with the thickest bristles. A vegetable brush works well and is inexpensive. Horsehair brush: This brush will get wax out of the bindings. Thick plastic scrapers: You may want to have more than one of these. Once they are covered in wax, the edges can get dull causing them not to work as well. File: You will need this to sharpen the scrapers. It should be placed in a vertical position and on a flat steady surface. Base cleaner: Always clean the bases of your skis before waxing. Paper towels: To clean skis and any messes. White or Blue Scotch Brite cleaning pads: These are used for polishing after the wax has been removed. Green Scotch Brite is too abrasive and should therefore be avoided. 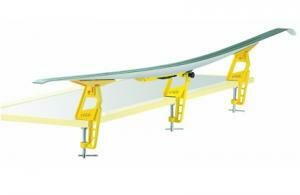 You will want to make sure that you have a clean working area for waxing your skis. If dirt or dust falls onto the ski during the waxing process, you might end up with an uneven wax job. Be sure to work in a well-ventilated room. If you have just come in from the snow, it's important to wait at least 30 minutes before applying wax to your skis. Failure to allow your skis to warm up to room temperature may warp your bases. This can permanently damage your skis. Place your skis in the ski vise to stabilize them. Use your brush to remove excess debris. Pour base cleaner onto a paper towel and clean the bases of your skis. Once the bases have been cleaned, heat your waxing iron to a low temperature. While the iron is heating, apply an even coat of wax to the bases of your skis. Be sure to cover the entire base. When the waxing iron reaches the proper temperature, hold it against the ski and wait for the wax to drip. Once this happens, move the iron up and down the bases. When you have finished, wait for the wax to cool down. You can check the temperature by touching it with the back of your hand. When the wax feels cool, use the scraper to remove it. Use the horsehair brush to remove any wax from the ski bindings. Use your nylon brush to make short, firm strokes from the tip to the tail of each ski then polish with Scotch Brite from tip to tail. If you notice that your skis are not gliding over the snow as fast and smoothly as they should be, it may be time to wax your skis. To maintain your skis you should wax them before every ski season or after every five to six times you go skiing. If you ski more frequently or aggressively, you may need to wax them more often. By waxing your skis on your own, you can save money and avoid a long wait at a ski shop to have them done in time for your next ski outing.